We love this photo! This is something we are not used to seeing on a wedding day. Kristine and Dave got married July 26th, 2015! They had their wedding at Brookfield Country Club in Clarence, NY. The bride got ready at her parents house, which was actually next door to her husband to be's house. That is how they met. Neighbors! So cute! Kristine is very very close with her family, especially her grandmother. She wanted grandma to be there when she was getting ready! After the dress, veil, and shoes were on, it was time to put on the garter. Grandma was not present for the actual putting on of the garter. This image happened when Neal brought in grandma for a portrait with the lovely bride! The garter was handed down from generation to generation. So, Kristine decided she wanted to show grandma that she had it on. She took a step back and lifted her wedding dress. Grandma's expression is priceless! She is smiling but had to look away from her granddaughters leg. Kristine thought nothing of it and just continued to smile! The room Kristine got ready in was perfect for portraits too. The wall color was gorgeous. Look how great it looks with grandmas lavender pant suit! Kristine had the most gorgeous vintage style dress. She was absolutely stunning! This reaction was definitely one for the books! 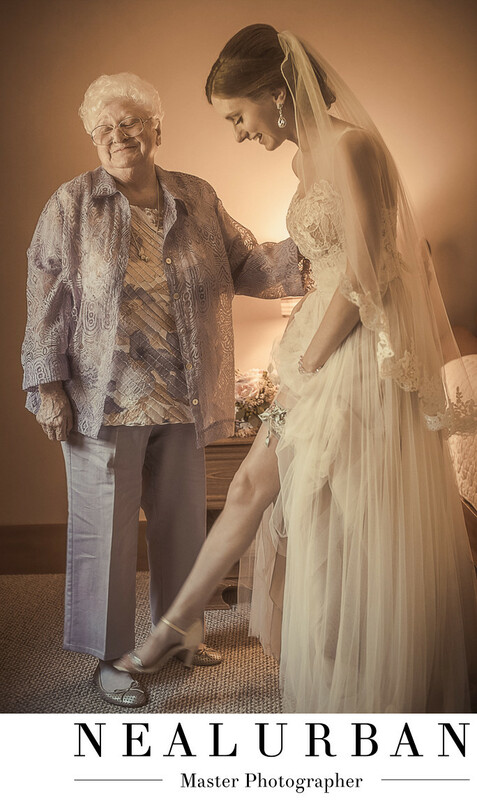 This will always be a favorite bride and grandmother moment! Location: 5120 Shimerville Rd. Clarence, NY 14031.